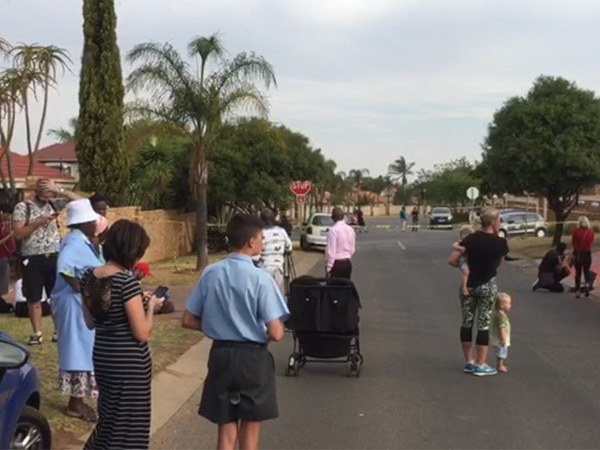 When Johan Delport returned to his home in the leafy Pretoria suburb yesterday, he couldn't believe his eyes. Helicopters, police cars, crime scene tape, dozens of bewildered bystanders -- and a man who was allegedly holding people hostage and firing shots from his roof. Johan Delport lives just seven houses down the street from where Danie Small shot and killed three people yesterday. One of the victims was Edward Gobey, the complex’s security manager. Danie was later found dead in the house. It has not yet been determined whether or not he killed himself. Johan says that Danie’s house is in the corner of the complex which is east or Pretoria. “When I got home there was a police helicopter circling my house. It was so close we could see the eyes of the policeman hanging out of the window of the helicopter,” says Johan. “One of the men who was standing outside lived in the complex just opposite the man’s house. The people who lived in this complex couldn’t go home,” says Johan. At one point police asked onlookers to move around there corner because “it is highly likely that something will happen,” said the police officer. By 7.30 pm two policeman and three security guards from the Brinant security company, who were trapped on Danie’s property, were freed. By 10 pm the taskforce entered his home and found him dead.